High-yield toner cartridge delivers outstanding results page after page in your Lexmark C935dn, C935dtn, C935hdn and C935dttn. Superior Lexmark design means precision pairing between printer and cartridge for value, quality and environmental responsibility you can count on. With a high yield, you'll change the cartridge less, save more per print and reduce your environmental footprint. 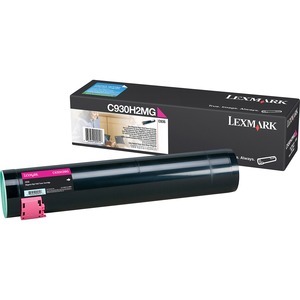 Lexmark Return Program Cartridges are sold at a discount, vs. the prices of regular cartridges, in exchange for the customer's agreement to use the cartridge only once and return it only to Lexmark for remanufacturing or recycling. Color cartridge yields approximately 24,000 pages.